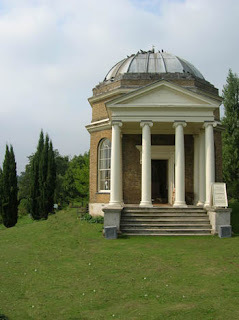 Well, in my post about fire destroying Garrick's villa I promised you a blog on the Temple to Shakespeare at Hampton, and here it is. Garrick built the Temple in 1756 and it now houses a small exhibition about the great actor-manager; it's usually open to the public on Sundays between April and September but we made a special trip during Open House London. On this weekend you can get into a range of historic buildings for free - we had a fantastic day in Hampton and Teddington, though I regret not taking the opportunity to visit Horace Walpole's Gothic castle Strawberry Hill while we were in the area (especially as it's now closed for restoration until 2010). Below is the front of the little Palladian Temple, which you'll recognise immediately from the Zoffany painting above, picturing Garrick with his wife Eva Maria and (I think) a little nephew, playing on the steps. 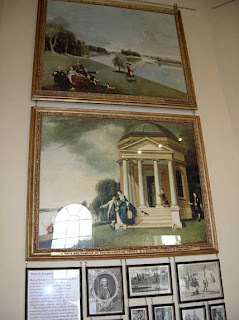 The Temple itself was possibly modelled on Lord Burlington's Temple at Chiswick House and was a nice spot to invite friends for tea and indulge in a spot of fishing. The riverbank alongside the Temple, which you can see in the picture above, was remodelled with advice by Lancelot 'Capability' Brown, who lived nearby and was a good friend of the Garricks. Their villa and the Temple were linked by a grotto-like tunnel under the Kingston to Staines Road which divides the two properties (sadly, it's not open to the public). 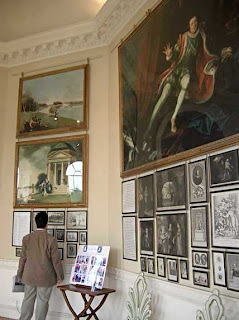 Below are some pictures of the permanent exhibition, including reproductions of the Zoffany conversation piece and Hogarth's portrait of Garrick as Richard III. We loved talking to the volunteers at the Temple, who fondly refer to the actor as 'our Garrick', and you have a real sense of his spirit being kept alive. 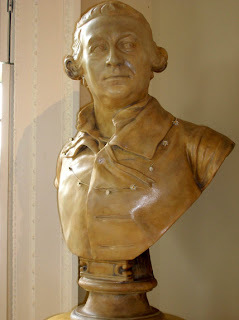 Below is a sculpture of Garrick, sporting a daisy chain. 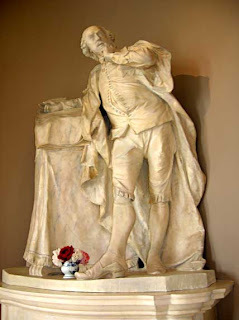 Garrick also commissioned the fashionable sculptor Roubiliac to create a life-sized marble statue of Shakespeare (below). Visitors were invited to 'sacrifice to Shakespeare' by leaving verses in his honour at the foot of the statue (these often ended up in the newspapers, thanks to Garrick's knack for self-publicity). The actor-manager also displayed his collection of supposedly Shakespearian artefacts here, including a glove, a salt cellar and a signet ring bearing the initials WS. All Temple photographs © Memoirs of the Celebrated Mrs Woffington. The daisy chain is very cute! Hi Laura - I'm feeling very rested thanks; hope you enjoyed the festivities. Probably no need for me to ever see another mince pie again. Happy New Year to you!